"Stuck in a Moment You Can't Get Out Of" is the second single from U2's 2000 album, All That You Can't Leave Behind. The song won the Grammy Award for Best Pop Performance by a Duo or Group with Vocal in 2002. Bono has said the song was inspired by a fictional conversation with his friend Michael Hutchence about suicide. "Stuck in a Moment You Can't Get Out Of" emerged while The Edge was working on a gospel-influenced chord progression on the piano. U2's lead singer Bono wrote the song about the suicide of his close friend Michael Hutchence, lead singer of the band INXS. The song is written in the form of an argument about suicide in which Bono tries to convince Hutchence of the act's foolishness. Bono characterized the song as a fight between friends, which he felt guilty for never having with Hutchence. As Bono said in 2005, "It's a row between mates. You're kinda trying to wake them up out of an idea. In my case it's a row I didn't have while he was alive. I feel the biggest respect I could pay to him was not to write some stupid soppy song, so I wrote a really tough, nasty little number, slapping him around the head. And I'm sorry, but that's how it came out of me." Mick Jagger and his daughter Elizabeth recorded backing vocals for the song, although these did not make the final mix. One is directed by Joseph Kahn, features an American football game between the "Flys" [sic] and the "Lemons" filmed at the Houston Astrodome, and contains various inside jokes and references to the band's past, such as the team names themselves - which were the titles of two U2 singles released in the 1990s. The video features a brief cameo in the beginning from John Madden, whose lines also feature several U2 references. The main part of the video shows a placekicker named Paul Hewson—Bono's real name—forced to re-live a field goal he missed that cost his team the game. The other video, directed by Kevin Godley, shows Bono being thrown out of a van several times, as if "stuck in a moment". At the end of the video, the rest of the band helps him up. Somalian-Canadian rapper K'naan performed the song live in July 2010 for iHeartRadio. "Stuck in a Moment You Can't Get Out Of" was released on 29 January 2001 in the UK, on 12 February 2001 in Australia, on 27 March in France, and on 30 October 2001 in Canada. All music composed by U2. Note: Track 4 only available on the Australian limited edition CD. Note: Only available in France. Note: Released only in Japan, featuring most B-sides from both regular CD releases. Note: A Canada-only release on late October 2001, also available on CD. "Big Girls Are Best" - produced by Flood and Howie B, this song was recorded after the PopMart Tour. Its lyrics include a reference to the Copacabana Palace hotel in Rio de Janeiro, Brazil ("Avenue Atantico, 1702"), where U2 stayed when they played in Rio in 1998. "Beautiful Day" (Quincey and Sonance Remix) - this remix was released, in a shorter version, in a promotional CD along with an issue of Q magazine. "Beautiful Day" and "New York" (Live from Farmclub.com) - this was a performance on 27 October 2000 for the American TV show, during U2's promotional tour of the All That You Can't Leave Behind album. "All I Want Is You" and "Even Better Than the Real Thing" (Live from Manray) - the first public listening of All That You Can't Leave Behind in the famous Paris nightclub was capped with an impromptu performance by U2, the first since the end of the PopMart Tour. These two songs were lifted from that performance. "Stay (Faraway, So Close!)" (Live from Toronto) - this performance from the Elevation Tour was transmitted live for the We Know Where You Live, Live! TV special, which was later released in DVD. "Elevation" (Vandit Club Remix) this remix was done by Paul Van Dyk. The album version, which appears on All That You Can't Leave Behind. This is the original version of the song. The acoustic version, which appears on the single, as well as in the "Walk On" single and the 7 EP. The same vocal track is used with a different, stripped-down arrangement. The radio edit, which was used in the promotional radio singles in the US. Part of the first verse and the outro are edited out, leaving the song with about three and a half minutes. ↑ Wenner, Jann S. (3 November 2005). "Bono: The Rolling Stone Interview". Rolling Stone. No. 986. pp. 48–67, 102–103. ↑ "INXS Singer Had Discussed Suicide With U2's Bono". Reuters. 27 December 2000. ↑ Gundersen, Edna (29 September 2010). "Rock Hall of Fame shows get a three-disc set for the ages". USA Today. ↑ Kootnikoff, David (2010). U2: A Musical Biography. ABC-CLIO. pp. xxvii. ↑ "Australian-charts.com – U2 – Stuck in a Moment You Can't Get Out Of". ARIA Top 50 Singles. Retrieved 6 June 2014. ↑ "Austriancharts.at – U2 – Stuck in a Moment You Can't Get Out Of" (in German). Ö3 Austria Top 40. Retrieved 6 June 2014. ↑ "Ultratop.be – U2 – Stuck in a Moment You Can't Get Out Of" (in Dutch). Ultratop 50. Retrieved 6 June 2014. ↑ "Ultratop.be – U2 – Stuck in a Moment You Can't Get Out Of" (in French). Ultratop 50. Retrieved 6 June 2014. ↑ "U2: Charts and Awards". Allmusic. Archived from the original on 21 November 2009. Retrieved 13 January 2010. ↑ "Danishcharts.com – U2 – Stuck in a Moment You Can't Get Out Of". Tracklisten. Retrieved 6 June 2014. ↑ "U2: Stuck in a Moment You Can't Get Out Of" (in Finnish). Musiikkituottajat – IFPI Finland. Retrieved 6 June 2014. ↑ "Lescharts.com – U2 – Stuck in a Moment You Can't Get Out Of" (in French). Les classement single. Retrieved 6 June 2014. ↑ "Musicline.de – U2 Single-Chartverfolgung" (in German). Media Control Charts. PhonoNet GmbH. Retrieved 6 June 2014. ↑ "Chart Track: Week 5, 2001". Irish Singles Chart. Retrieved 6 June 2014. ↑ "Italiancharts.com – U2 – Stuck in a Moment You Can't Get Out Of". Top Digital Download. Retrieved 6 June 2014. 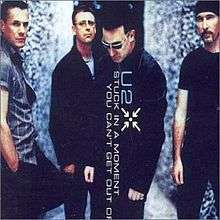 ↑ "Dutchcharts.nl – U2 – Stuck in a Moment You Can't Get Out Of" (in Dutch). Single Top 100. Retrieved 6 June 2014. ↑ "Charts.org.nz – U2 – Stuck in a Moment You Can't Get Out Of". Top 40 Singles. Retrieved 6 June 2014. ↑ "Norwegiancharts.com – U2 – Stuck in a Moment You Can't Get Out Of". VG-lista. Retrieved 6 June 2014. ↑ "Swedishcharts.com – U2 – Stuck in a Moment You Can't Get Out Of". Singles Top 100. Retrieved 6 June 2014. ↑ "Swisscharts.com – U2 – Stuck in a Moment You Can't Get Out Of". Swiss Singles Chart. Retrieved 6 June 2014. ↑ "Archive Chart: 2001-02-10" UK Singles Chart. Retrieved 6 June 2014. ↑ "U2 – Chart history" Billboard Hot 100 for U2. Retrieved 6 June 2014. ↑ "U2 – Chart history" Billboard Alternative Songs for U2. Retrieved 6 June 2014. ↑ "U2 – Chart history" Billboard Mainstream Rock Songs for U2. Retrieved 6 June 2014. ↑ "U2 – Chart history" Billboard Adult Pop Songs for U2. Retrieved 6 June 2014. ↑ "U2 – Chart history" Billboard Pop Songs for U2. Retrieved 6 June 2014.